UNIMPRESSED WITH THE NUMBERS: Jack Welch: “Obama Is Manipulating The Jobs Numbers Because His Debate Performance Was Awful.” The sudden change certainly was convenient. The economy is creating so few jobs that millions are staying out of the labor market, thereby prevent the unemployment rate from soaring. In September we created a measly 114,000 jobs, but the rate declined to 7.8 percent. Consider that if labor force participation had held even since January (when it was 8.3 percent), the jobless rate would be 8.4 percent. If the job participation rate were the same as when Barack Obama took office, the rate would be 10.7 percent. The broader U-6 rate (unemployed plus total employed part time for economic reasons) held steady at 14.7 percent. 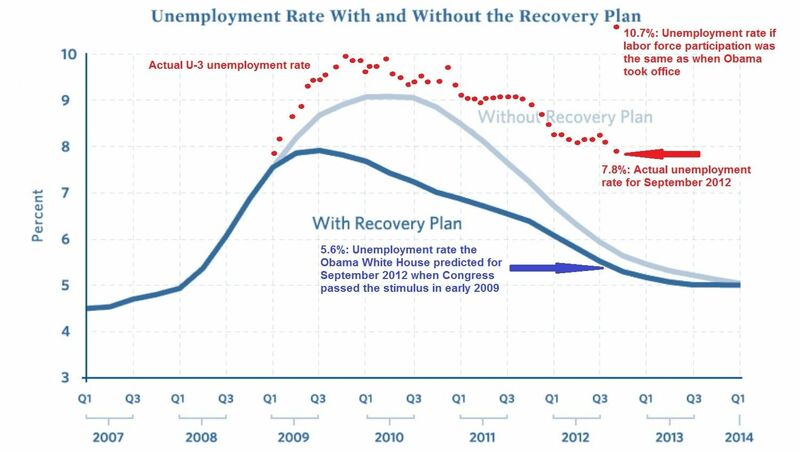 Obama can spin the numbers anyway he likes, but this is not an economic “recovery” in a meaningful sense. We are adding fewer jobs on average per month than we did last year (143,00 vs. 153,000). When you can’t trust the numbers, it becomes harder still to have a meaningful recovery. Plus, a reprise and update of that devastating graphic of what Obama promised vs. what he delivered.